An overview of the peristome of Opercularia coarctata. The corrugated wall, the equivalent to the ribbed wall of Paramecium, contains tubular projections of alveoli and cross sections of two ribbons of microtubules, one of 2 microtubules and one of 4 microtubules. The ends of these ribbons, at their origins, are covered by a myoneme which, in turn, is accompanied by a layer of ER. 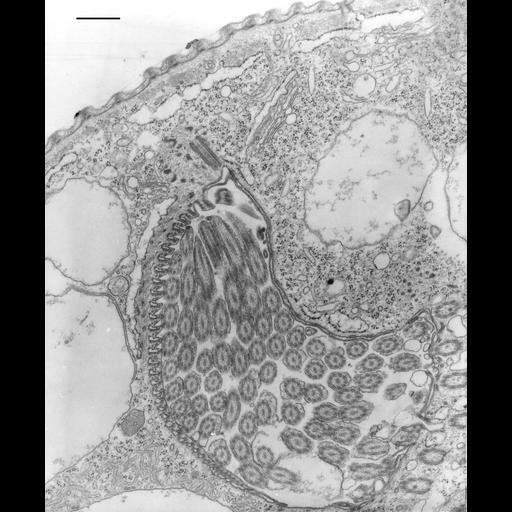 The microtubules will extend along the wall of the peristome and some will pass beyond the cytostome to form the lamellae of the cytopharynx. Vesicles bind to the lamellae and provide membrane for the nascent food vacuole. Oral polykinetids, myoneme, endoplasmic reticulum, contractile vacuole, microtubular ribbons, pellicular pores, and Golgi complex can be seen. TEM taken on 6/10/69 by R. Allen with Philips 300 operating at 60kV. Neg. 14,800X. Bar = 0.5µm. A print of the negative was scanned and processed in Photoshop. This image is best used for qualitative analysis. A high resolution image (CIL:7335) is available for quantitative analysis. Standard glutaraldehyde fixation followed by osmium tetroxide, dehydrated in alcohol and embedded in an epoxy resin. Microtome sections prepared at approximately 75nm thickness. Additional information available at (http://www5.pbrc.hawaii.edu/allen/).